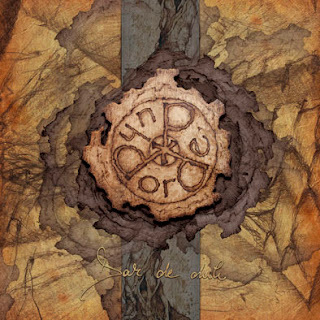 WYRD'S FLIGHT by Alex Mysteerie: Album Review: DORDEDUH "Dar De Duh"
Album Review: DORDEDUH "Dar De Duh"
I feel a preamble is needed here. Making comparisons is not part of my reviewing style (whilst trying to do an honest critique, I write about emotions first and foremost), so I will disappoint some readers. Not only shall I not measure up Dordeduh’s long anticipated new album with Negura Bunget’s “Virstele Pamintului” but shan’t even fully draw into the picture the much celebrated “Om”. You are free to call this bad or lacking journalism but, after decades of close involvement with music, I am aware of how distasteful it is for the musicians involved to read how “this does or does not sound like so-and-so”. In the case of DDD and NB there was of course the sore matter of a bitter split to consider, and I decided very early on to give them both a chance without preconceived opinions. Even those directly involved might have a different view on that episode as time passes by, so why waste any time on an old private issue when life inexorably flows on, hurt hearts mend, spirits follow freely their own paths? And why should I dissect an album like “Om”, which has indeed become an important part of BM metal history – as long as 6 years ago! - to offer easier access to “Dar De Duh”, even if it is deemed as its legitimate follow up? Because Hupogrammos and Sol Faur have actually spent YEARS over this new album: can you imagine the pressure that fell on their heads?... Not only the fans were expecting a confirmation that the true incarnation of the original NB project were to be found here rather than elsewhere, but they had an actual masterpiece to match to say the least. So let’s get that issue over and done with quickly. “Dar De Duh”, in spite of the lengthy time gap from the release of “Om”, IS its undisputed, legitimate heir. Why? Majesty and beauty alone of course are not enough justification: it’s that overwhelming spirit, that mesmerizing feeling and utterly inimitable sound that makes you think: “Yes, this band takes me through the same kind of unique, amazingly powerful, passionate and mysterious path that swept me off my feet so many years ago”. Whatever Hupogrammos and Sol Faur will say in their interviews about being different people from the ones who wrote “Om” (naturally), the fan will still find him/herself immersed in a dimension that feels intensely similar to the beautiful magic of old! If this is all you needed to know, let’s rejoice together and praise the artists, who were undoubtedly involved in a painstakingly meticulous journey. There is no question, “Dar De Duh” needs your full on attention: do not even bother if you are hoping to get a quick first impression while doing something else. In order to plunge into its deeply woven heart, you must listen with your eyes closed, letting go of all your thoughts. You will struggle to find a more passionate and dedicated piece of art, and that grants you a powerful and enriching experience. There are many bands around who try their hardest to convey a feeling of the rich historical layers of their land through their music, and DDD carry on being one of the absolute best at this task. Visiting Transilvania is yet a dream to come true for me, but the work that these artists are producing is vivid and gratifying, a stimulus to anybody’s imagination. If, on top of that, you happen to be a dreamer, well the journey becomes simply breathtaking! I am leaving all details involving the conceptual work that sustains inextricably the music to my interview with Hupogrammos, soon to be published here. So here is a brief description of how some of the most relevant tracks make me feel. “Flacarii” is the start of the adventure proper for me: the flame is ignited and the riders have left. Their quest in not yet clear (lyrics in English please?) but it matters not, as this is your own individual journey to make! The presence of ancient magic is thick in this track. Again, a spellbinding aural rollercoaster that blends golden ambrosia with venomous potions - effortlessly. It is alchemic perfection to the old BM heart, the one that beats with the noblest passion for knowledge and fulfillment. And by the time one gets to “Calea Rotilor de Foc” one feels certain that this intense human journey does hide a tremendously important secret amongst its thick yet smooth folds. Art like this has the power to give you a priceless gift: that of unearthing something precious that lay deeply buried within yourself. And the progressive stream of this splendid track, which often breaths through acoustic murmurs, is the perfect vehicle for such stirring spiritual adventures. “Pandarul” jumps in forcefully, waking you up from the comforting feeling of having arrived somewhere… It plunges you in uneasily cold waters, it even seems to kind of deride you: foolish is the one who believes to have reached the truth! In general the unique organic sound that makes Dordeduh’s richly atmospheric pagan black metal so recognizable above hundreds of bands, has become even more mesmerizing and majestic: here is how the folk element truly captures the ancestral spirit that is unmistakably local, but also splendidly and unquestionably universal. In the end this is the secret and the gift of this band: they make our skin crawl, our heart wrench, our spirit fly… because (outstanding musicianship aside) they have searched for their shamanic heart. Something that cannot be found without a hard inner battle against the ego. Hush…… is “Dojana” a warning? DDD go to the roots of humanity and emerge with their spirits in flames! But don’t be fooled, as they also purposely carry the water of Life... An illuminating album. Out on 28th September 2012 on Lupus Lounge/Prophecy Productions. PS: A shorter version of this review is also appearing on Avantgarde-Metal.com.